A last look at the Tatara Bridge. 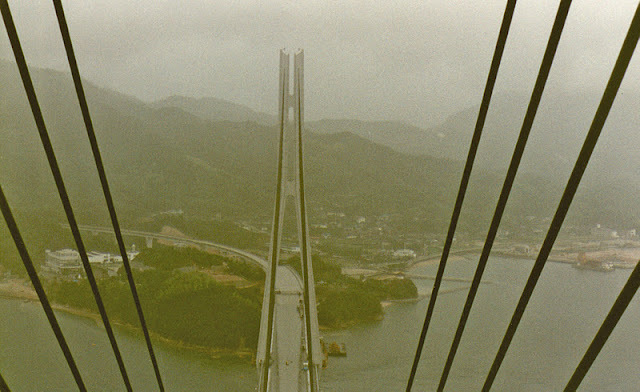 The Honshu-Shikoku Bridge Authority kindly took me on a boat trip in 1998 to look at construction of their expressway. The Tatara Bridge was complete except for some final work on the deck. It was a rainy day and clouds had descended to the tops of the towers. The main span of the Tatara Bridge is a 890 m steel box girder. The side spans are 270 m and 320 m long and are prestressed concrete box girders at their ends to balance the weight. More information on fabrication of the bridge is provided by Uesugi Hideo and information on the erection of the bridge is provided by Satou Yoshyuki. Honshu-Shikoku Bridges: Tatara Bridge (3) by Mark Yashinsky is licensed under a Creative Commons Attribution-NonCommercial-ShareAlike 3.0 United States License.